EPA 24 MPG Hwy/17 MPG City! Third Row Seat, Quad Bucket Seats, Power Liftgate, Rear Air, Remote Engine Start, Onboard Communications System, Back-Up Camera, AUDIO SYSTEM, COLOR TOUCH RADIO WITH.. TRANSMISSION, 6-SPEED AUTOMATIC, ENGINE, 3.6L SIDI V6, Aluminum Wheels CLICK NOW! Third Row Seat, Quad Bucket Seats, Power Liftgate, Rear Air, Back-Up Camera, Onboard Communications System, Aluminum Wheels, Remote Engine Start Rear Spoiler, Keyless Entry, Privacy Glass, Remote Trunk Release, Steering Wheel Controls. TRAILERING EQUIPMENT includes (V08) heavy-duty cooling and (VR2) trailer hitch, ENGINE, 3.6L SIDI V6 (288 hp [214.7 kW] @ 6300 rpm, 270 lb-ft of torque [364.5 N-m] @ 3400 rpm) (STD), AUDIO SYSTEM, COLOR TOUCH RADIO WITH INTELLILINK AM/FM/SiriusXM/HD radio with CD player, 6.5 diagonal touch-screen display, USB port and auxiliary input jack (STD), TRANSMISSION, 6-SPEED AUTOMATIC (STD). 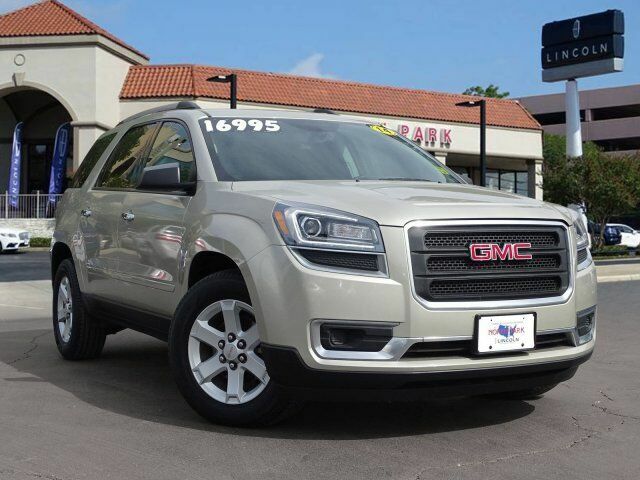 GMC SLE with CHAMPAGNE SILVER METALLIC exterior and EBONY interior features a V6 Cylinder Engine with 288 HP at 6300 RPM*. Edmunds.com`s review says In addition to its spacious interior, the GMC Acadia earns high marks for its comfortable ride, easy-going driving demeanor and 288-horsepower V6, which provides ample thrust for daily commutes and long interstate runs alike.. Great Gas Mileage: 24 MPG Hwy.